Apple Tree Cottage est un ancien refuge d'animaux restauré avec amour, transformé en un chalet de deux chambres. Situé sur un seul niveau, il y a une chambre double et une chambre à deux lits (les lits peuvent être mis sur demande) et une grande salle de bains familiale à droite de la propriété et un grand salon ouvert avec une cuisine entièrement équipée comprenant un lave-vaisselle À gauche du bâtiment. Avec de beaux planchers en érable partout et une belle vue du salon à l'avant de la propriété, traversant la cour et sur la maison de l'arbre / aire de jeux et verger. Apple Tree Cottage a son propre jardin privé avec des sièges extérieurs et un barbecue à charbon de bois Weber, les invités sont également libres d'explorer le reste des 15 acres de terre avec ses cours d'eau, leurs prairies et leur bois. Four au bois, salle de bain extérieure (avec deux bains traditionnels en fonte et une douche) et beaucoup de jeux disponibles. Un chien bien élevé est autorisé dans Apple Tree Cottage pour un montant de £ 25. Un deuxième chien est considéré pour un supplément de £ 25. Apple Tree Cottage est un ancien refuge animalement restauré, transformé en chalet de deux chambres. Situé sur un seul niveau, il y a une chambre double et une chambre à deux lits (les lits peuvent être mis sur demande) et une grande salle de bains familiale à droite de la propriété et un grand salon ouvert avec une cuisine entièrement équipée comprenant un lave-vaisselle À gauche du bâtiment. Avec de beaux planchers en érable partout et une belle vue du salon à l'avant de la propriété, traversant la cour et sur la maison de l'arbre / aire de jeux et verger. Apple Tree Cottage a son propre jardin privé avec des sièges extérieurs et un BBQ au charbon de bois, mais les invités peuvent explorer le reste des 15 acres de terre avec ses ruisseaux, leurs prairies et leur bois. A gem of a find, we can’t wait to return for another stay! Throughout our whole stay, all we kept saying was how beautiful the cottage is, how clean it is and what a little gem we had stumbled across! Everything was perfect and so well thought through. The owners were most helpful and accommodating. This is by far the best holiday home we have ever had the joy of staying at and we are already looking at our diary to plan another stay, but this time bringing the whole family! Thank you Vicky and Nick! Thank you so much for your wonderful review. It is so great to hear that you thought the cottage was perfect and the best you have stayed in - it really means a lot to us. We delight in presenting it super clean, cosy and homely - so thank you for noting this. We would love to welcome you and your family back one day soon and look forward to hearing from you again. Excellent location, exceptionally clean and comfortable for us and our puppy. So good,we rebooked ! We loved the location ...so close to Exeter ...whilst nestled within beautiful Devon countryside. The immediate farmland is a real treat for walks and much appreciated by our puppy. Loved the apple juice and cider provided and next time we will be sourcing more local treats. This cottage is a real find. Looking forward to returning many times to both cottages on site. The tile alone is just lovely - what a great summary thank you so much. We are so pleased you enjoyed your stay and loved the cottage. It really is great to have the additional land to walk, play and enjoy - brilliant you were able to make use of it all. We look forward to welcoming you all again soon. A restful, beautiful setting, (a bit remote so roads were challenging for us but that's because we are not used to one-lane tracks and 10ft hedges!) Friendly and helpful proprietors. The cottage is a cosy open plan space that is comfortable and light, despite it being January. The windows in the bedrooms are skylights, so if you like to sleep with a window open, not an option - especially in January - but that's a minor thing. They are dog friendly. Thank you so much for your review, we are pleased you found the cottage comfortable and restful, as well as being in a lovely setting. Great to hear. We are so lucky that we have so much further land to offer our guests when they stay - great for dog walking as well. For future reference, although the bedroom windows are skylights, they do open if required. You use the pole that opens and closes the black out blinds to open the windows as well. We know what you mean, compared to most major roads the lanes of Devon can seem a bit narrow - thankfully there are plenty of passing places and generally drivers are pretty respectful of other cars on the roads. We were pleased to help you when required and it was great to meet you all. A lovely, quiet and quaint countryside cottage. We loved our stay. Four of us stayed for New Years. The place was perfect and very cosy. It had everything we needed and a well equipped kitchen. The pub is so close and just perfect for a quaint countryside experience. Vicky and Nick were really great hosts. Very relaxed about any requests and quick to respond. I would definitely recommend. Oh and the outdoor bath was a great experience too! (You will need a car). Absolutely beautiful property in a lovely place. We stayed in Apple tree cottage with our 2 small children and dog during the October half term. The cottage was beautiful and very spacious. A very comfortable stay for a week's holiday. It had every thing we needed and in such a lovely location. We enjoyed walking around the surrounding land and the boys loved the tree house and play area. The owners were lovely and very helpful when we needed their assistance. We would and will be recommending this beautiful place to everyone. Thank you Vicky and Nick . We really hope to visit again in the future. Thank you so much for your lovely review, we are so pleased you had a good stay and enjoyed all that we have on offer here at The Orchard Retreat. It is great to hear that the cottage suited you all so well and had everything you needed for a weeks holiday. The land the treehouse etc are a real bonus, so we are pleased you were able to use it all. We look forward to welcoming you again one day. The only downside to our week in this lovely cottage in such a beautiful location, was the one day of light rain in a week of, otherwise perfect, hot sunshine & blue skies! 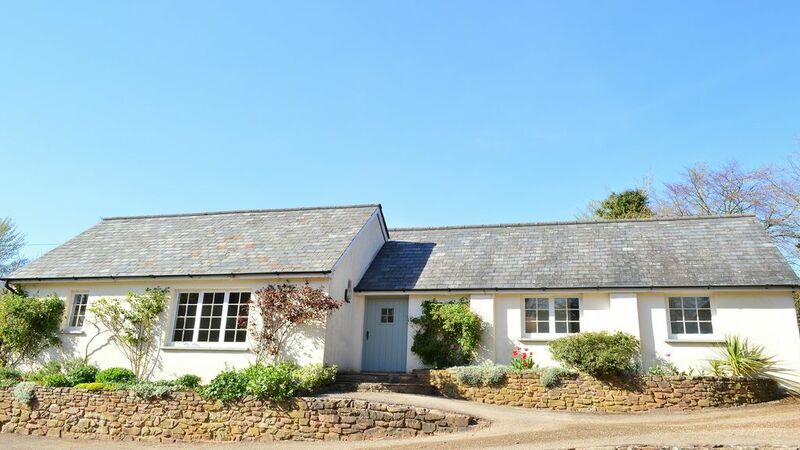 We were so lucky to pick this week in May that turned out to be the turning point in Spring temperatures, but even if the weather hadn't been so perfect, Apple Tree Cottage & Orchard Retreat had plenty of home comforts and entertainment options to keep us well occupied. Books, DVD's and games were all available, plus the new Badminton court & table tennis are really going to be a hit with future guests. This tranquil streamside setting, with the fantastic fields to wander through, admiring the trees and complete carpet of Wild Garlic was just idyllic, Barney really loved his morning walk and often a quick catch up with his new mate, Moon. Apple Tree Cottage is beautifully appointed with a well equipped kitchen, plus the sharpest knives we have ever experienced in a holiday cottage, such a relief to be able to slice tomatoes without squashing them!! Comfy sofas, quality beds and a huge bathroom were all icing on the cake, not forgetting the barbecue, which was well used during our week here! The on site micro shop is a real boon, we made purchases of the delicious local ground coffee, which since we had forgotten to pack any, was a real life saver! Plus really good local charcoal, which was great for the first impromptu barbecue and for the next 3! Next time we hope to make use of the on site wood fired pizza oven! Vicky, Nick, Maddy & Moon all gave us an enthusiastic & friendly welcome, we felt at home from the word go & thank you so much for the welcome goodies, such a lovely thought, (your home produced apple juice was really delicious). We hope we can stay at Orchard Retreat again soon, the location is great, easy access to Exeter, the coast and all the lovely woodland & forest walking in Mid Devon. Bickleigh Mill is well worth a wander around & there are numerous National Trust Properties within easy reach. Castle Drogo with it's fabulous views and fantastic access to the Fingle Bridge Gorge walk, much of it alongside the river, is a must and the added bonus is the Café at Drogo serves really good snacks & meals. A visit to Tiverton to walk the towpath or catch a horse drawn boat along the Grand Western Canal, with it's ducks, swans & wildlife is a really great way to while away a few hours. Thank you so much for your gorgeously detailed review. We are so thrilled you loved the cottage and had everything you needed and were comfortable. So pleased the sharp knives helped with your food prep, brilliant. Plus so nice to hear that our location worked so well for you and great to have added your day trips in for future guests, so helpful, thank you. We would love to welcome you both and Barney again, Moon really did take to him - so sweet to see them playing. Have a lovely summer, lets hope the sun stays out, it is just so lovely! Les deux côtes nord et sud peuvent être accessibles en moins d'une heure de route, alors prenez votre choix parmi les nombreuses plages de Devon. Lynton et Lynmouth sont adorables avec son chemin de fer qui vous emmène de la plage à la ville, les vues du train sont spectaculaires et vous pouvez même emmener votre chien là-bas. Saunton Sands est un paradis pour les surfeurs et une belle plage pour marcher, nager et se détendre. Situé à plus d'une heure, il faut visiter la plage et y trouver un magasin et un restaurant. Tiverton M5 à The Orchard Retreat se trouve à 20 minutes de route à travers des paysages magnifiques. Un demi-mile de là est le village de Cheriton Fitzpaine qui a un magasin et un pub du village. Nous recommandons vivement le pub du village, The Ring of Bells, à seulement 20 minutes à pied de The Orchard Retreat, offrant de délicieuses spécialités locales et des bières et des bières locales et un menu vraiment imaginatif. Thornes Farm Shop est juste à côté (à environ 8 minutes à pied) qui a un café dans la maison et beaucoup de produits locaux charmants. Exeter se trouve à 20 minutes en voiture avec une multitude de magasins, cafés et restaurants à choisir. Crediton est la ville la plus proche, à seulement 10 minutes en voiture. Ici, vous trouverez de belles petites boutiques, un café fantastique, un marché agricole, des banques et deux grands supermarchés. Check in is from 3.30pm and check out is at 10am.